This virtually indestructible cover (slotted for horn/strobe unit alarms) is designed to stop vandalism and accidental damage for flush mounted units. 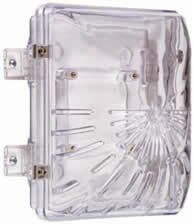 Molded of clear, thick, UV-stabilized polycarbonate material, backed by a lifetime guarantee against breakage in normal use. Slots in the STI 1210C allow the horn to be heard. 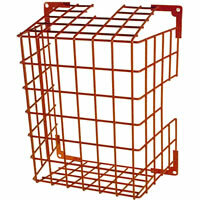 Unit comes with an open style back box with external mounting tabs. This virtually indestructible cover (slotted for horn/strobe unit alarms) is designed to stop vandalism and accidental damage for flush mounted units.